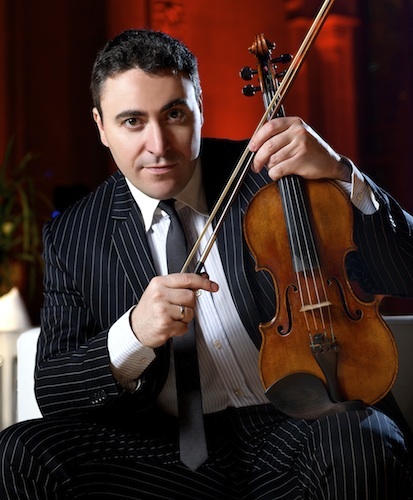 Maxim Vengerov performed the Tchaikovsky with the New York Philharmonic. The New York Times: "...Mr. Vengerov delivered an engrossing account of the Tchaikovsky, enlivened by the glossy, warm sound of his 1727 Ex-Kreutzer Stradivarius..."
Aisslinn Nosky performed the Haydn with the Handel and Haydn Society. Boston Globe: "Nosky, who led the 15-member ensemble, was a mischievous soloist in the Allegro moderato first movement. The Adagio serenade over plucked strings went quickly, like an intermezzo, whereas the Presto finale was not rushed. It all sounded casual and easy, but not without heart." Boston Classical Review: Her playing was consistently sparkling in its energy and finely attuned to Classical polish and style.That is due to Nosky’s shimmering tone and exceptional command of her instrument." Philippe Quint performed works by Lera Auerbach in recital with Auerbach and cellist Joshua Roman. Examiner.com: "His accounts of the intensity of the individual movements and the manic quality of the mood swings from one movement to the next seized the attention from the opening gesture and would not let go until the final cadence." Elena Urioste performed the Elgar with the Vermont Symphony Orchestra. Times Argus: "Urioste, with a warm and personal sound she used expressively, managed the full range of emotions from fiery virtuosity to intimate tenderness, with flair and depth. It was not only exciting, her playing in the slow movement brought many to tears." Daniel Hope performed the Korngold with the San Antonio Symphony. San Antonio Express-News: "British violin star Daniel Hope immediately proved why he is so widely recorded. Hope possesses a powerful instrument, a richely textured Guarneri, and he knows how to use it. His bow control is so complete, it widens his range of expression." Gidon Kremer performed works by Weinberg and Mozart in recital with pianist Daniil Trifonov. New York Classical Review: "Here and there on Friday he was able to muster a warm tone, but for the most part, he sounded anemic, his vibrato weak and his intonation unsure." William Preucil performed the Dvorák with the Cleveland Orchestra. NUVO: "Preucil played with an infectious liveliness well matched to the main theme of the movement, with the orchestra behind him in a consistently tasteful and complementary mood." The Plain Daler: "Seated on a platform next to Hrusa, the artist dispensed with virtuoso display and concentrated instead on melody and feeling. The result was a compelling musical trilogy that was gritty, bright and resilient by turns, and often lyrical enough to suspend time altogether." Julia Noone performed Szymanowski's Violin Concerto No. 2 with the New World Symphony. South Florida Classical Review: " She has a wonderful tone, with a rich vibrato that gave heat to the soaring passages with which the work abounds, displaying a technique that allowed her to make effortless leaps up to the highest notes without a break in the melody. Yet she also imbued less showy passages, such as the long inward-looking melodies, with expressiveness and meaning." Marc Bouchkov performed the Tchaikovsky with the Saskatoon Symphony Orchestra. The StarPhoenix: "Saskatoon Symphony Orchestra guest soloist Marc Bouchkov was so animated Saturday night he could have been making a violin workout video...Bouchkov’s lively performance will linger long for those lucky enough to have witnessed it as the high point of the symphony’s Northern Lights concert." Sarah Kwak performed the Glazunov with the Oregon Symphony. The Oregonian: "She gave it lyrical depth, thoughtful phrasing, myriad shadings of tone and easy technical prowess — the last movement, a delightful set of variations on a jaunty tune, was a virtuoso thrill ride of flying fingers, double stops, pizzicato and high harmonics, and she coasted through it." Kyra Humphreys performed Mozart's Violin Concerto No. 4 with the Royal Northern Sinfonia. The Northern Echo: "Playing with characteristic zest, Humphreys delivered a scorching cadenza that explored every emotional possibility of her instrument, while her adagio was invested with an ineffable grace." Bella Hristova performed the Sibelius with the Omaha Symphony. Omaha World-Herald: "But though her virtuosity was evident Saturday night in Sibelius’ Violin Concerto, she never seemed to truly take command of the stage or match the passion and fire of the orchestra behind her." The New York Philharmonic has named Esa-Pekka Salonen Composer-in-Residence. Gramophon: He will compose works for the orchestra for three years, beginning in the 2015/16 season. In the 2015-16 season the New York Philharmonic will perform Salonen's LA Variations (September 25-26, 2015) and Karawane (March 17-19, 2016), and Salonen himself will conduct Messiaen's Turangal?la-symphonie (March 10-12, 2016). Salonen will also oversee the Philharmonic's new music biennial festival in June 2016. Violinists Itzhak Perlman and Nicola Benedetti will join manager Charlotte Lee at her new agency, Primo Artists. WQXR: "A top manager at IMG Artists has left the management agency after 17 years and brought two of her biggest-name artists with her."